Mitral valve disease is quite variable and can occur as an isolated defect or in association with other complex left sided lesions. These lesions are often best described with detailed pre-operative imaging studies to define the valve anatomy and to access associated left heart disease. Depending on the type of mitral valve disease, various surgical repair techniques have led to improved survival in the recent era. We describe lesion specific approach to mitral valve repair and results. Mitral valve disease in the pediatric patient is quite variable and ranges from a routine cleft in the anterior leaflet of the mitral valve to complex mitral stenosis associated with Shone's complex or hypoplastic left heart syndrome (HLHS). Further complicating the management of these children are the associated concomitant cardiac lesions, which can dramatically affect clinical outcomes. Historically, mitral valve replacement (MVR) has been associated with significant morbidity  in the pediatric population and thus considerable attention has been directed to mitral valve reconstruction in children over the last decade. , As mitral valve reconstructive techniques have been perfected, they evolved as the preferred approach for mitral valve stenosis and/or insufficiency in the pediatric population. Because of this, referrals for mitral valve surgery have increased since the mid-2000s. This study reviews our 6-year experience in mitral valve operations and focuses on the evolving technical aspects of mitral valve reconstruction. In order to provide optimal treatment of the entire affected valve complex, it is important that systematic examination begins early. We often obtain preoperative three-dimensional echocardiography (3D-echo), which improves our ability to access more anatomic features. It allows a detailed assessment of the entire mitral valve complex, including the subvalvar area, annulus, leaflets, and chords. With associated hypoplasia or borderline hypoplasia of the left ventricle, magnetic resonance imaging (MRI) is used to assess left ventricular (LV) volumes, location, and extent of LV endocardial fibroelastosis, and quantify the flow across the mitral valve for purpose of deciding on initial strategy, whether it be single-ventricle or two-ventricle. Transesophageal echocardiography (TEE) was used routinely in all cases where an echo probe could be inserted, including young infants. With the availability of smaller TEE probes, pre- and postoperative echo studies can be performed in the vast majority of patients. In patients in whom a TEE probe could not be inserted, postbypass epicardial echocardiography was performed to assess the mitral valve function. In the past 3 years, 3D TEE probes have become available. These probes were used in all children weighing over 40kg if the probe was able to pass in the esophagus. Cardiopulmonary bypass was generally established via standard single aortic and bicaval cannulation, followed by moderate hypothermia and cardioplegic arrest. Ventricular fibrillation was used in some patients, usually for the initial assessment of anatomy and to plan the repair. The mitral valve (MV) was exposed through the atrial septum or directly though the left atrium after developing Sondergaard's groove. Multiple MV repair techniques were used depending on the associated pathology, which are outlined in the following. As a routine, we close the cleft in all cases of partial or complete atrioventricular (AV) canal defects. 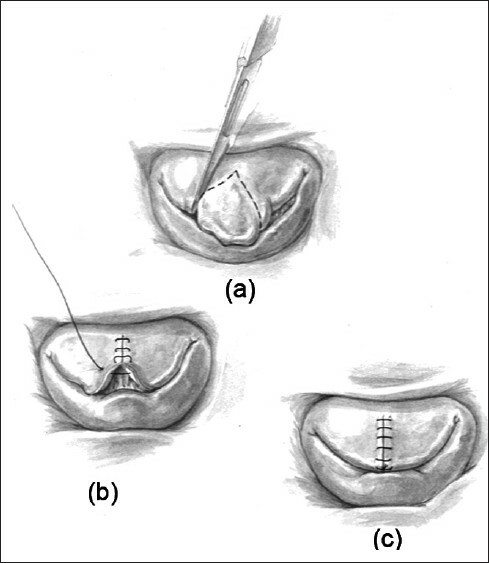 Cleft closure is done using double running 6-0 or 7-0 monofilament polypropylene suture, which is brought down to the tips of the chords except in patients were stenosis is a concern, and tied loosely to avoid reducing the height of the neo-anterior leaflet [Figure 1]. Patients in whom we are concerned about stenosis include mostly parachute or forme fruste parachute mitral valve with a functionally single left ventricular papillary muscle and variable development of the mural leaflet. In this case, the valvar orifice is mainly the cleft, which we routinely leave mostly or partially open, as closure would lead to severe stenosis. Our approach is to close the base of the cleft in most cases, and progress with closure towards the chordal attachments until the predetermined inflow orifice size is achieved based on the patient's body size and predicted Z-score of −2. After cleft closure, central or commissural regurgitation, as detected by saline injection, were corrected by annuloplasty, either using a De Vega-type double running suture along the left lateral annulus from commissure to commissure (ie, "posterior annuloplasty"), or by commissural annuloplasties. Congenital mitral regurgitation (CMR) lesions are classified according to the leaflet motion, using Carpentier's seminal functional classification of mitral regurgitation: (1) normal, (2) enhanced (or prolapsed), and (3) restricted leaflet motion. , This classification translates into different causes of CMR and their associated treatment, although there is sometimes overlap or association of more than one mechanism that leads to regurgitation. Detailed analysis of the mitral complex, including the annulus, the leaflets and the subvalvar apparatus both by preoperative echocardiography and intraoperative assessment should be used. In the first functional group, regurgitation is due to a lack of apposition of the leaflets from primary annular dilatation (extremely rare) or more frequently leaflet defects, such as a cleft or agenesis of a leaflet segment. Annular dilatation was managed by different means of annuloplasty, as outlined below. In most cases, a cleft was closed primarily, using the same technique as described in closing the left atrioventricular cleft in CAVC. We favor a double running closure, the first layer in a horizontal mattress and the second layer over-and-over, extending to the tip of the chords. It can be necessary to fill the space between the cleft edges with a pericardial patch, particularly if the annulus is dilated. Leaflet defects, such as holes or localized agenesis, can be treated by direct suturing or pericardial patch repair depending on the size of the defect, taking care that the leaflet-free edge remains adequately supported by chords. In restricted leaflet motion, the lesions often overlap with those described in the section on CMS. The lesions include "commissural fusion",  in which the commissural area is covered by endocardial fibroelastosis, along with fused chords and hypertrophied papillary muscles adherent to the commissure, and "short chordae syndrome," were the chords are thickened, the interchordal spaces are reduced. Van Praagh demonstrated 20 years ago that, in these anomalies, the mitral leaflets are covered with endocardial fibroelastosis (EFE) that creeps onto the chords. By trans-illumination from the ventricular surface of the valve, one can easily make out this extra tissue between the chords, which only appear short. They are actually normal sized, but covered with this EFE. Repair consists of resection of this EFE from the valve leaflets and chords, to restore mobility and pliability to the leaflets and subvalvar apparatus. Although Carpentier et al. proposed commissurotomy, leaflet augmentation and annuloplasty to treat this type of lesion, as we eluded to above, resection of EFE and obtaining a mobile leaflet is the only way to obtain a sufficient coaptation height. Furthermore, commissurotomy in this type of lesion can create commissural regurgitation. Annuloplasty was performed when annular dilatation was present. Multiple annuloplasty techniques were used including De Vega-type double running suture annuloplasty along the posterior annulus, commissural annuloplasties, or ring annuloplasty in older children. The biodegradable ring, which has shown promising results in children with mitral insufficiency, ,,, was used in the mitral position in four patients with atrioventricular valve regurgitation and in one patient with mitral regurgitation after repair of atrial and ventricular septal defects at our institution (under an FDA exemption, approved). It has been shown both in animal models  and for annuloplasty in the tricuspid position  to allow for annular growth without compromising stability of the repair. Longer-term results remain unknown. 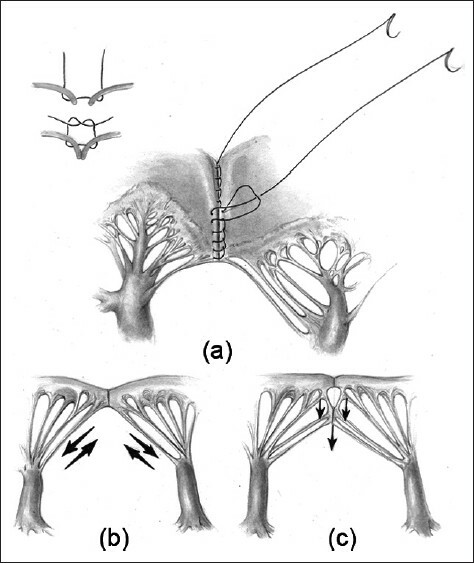 For restricted leaflet mobility, secondary chords were divided and/or leaflets were augmented with autologous pericardium. In repeat operations, prior suture and/or pledget material was removed. For residual clefts, running or interrupted cleft closure was performed. From January 1, 2005 to December 31, 2010, 1609 heart valve operations were performed at Children's Hospital Boston. Over these 6 years, there has been 45% increase in mitral valve (MV) operations, which totaled 778 MV operations on 673 patients [Figure 4]. There were 724 MV repairs (which included 360 atrioventricular canals) and 54 MVR. When stratifying by age, there were 33 operations performed on neonates (0-30 days), 362 on infants (1 month to 1 year), 343 on children (1 year to 18 years), and 40 on adults (patients greater than 18 year old). The most common fundamental diagnoses at this center from 2005-2010 considering all 673 patients were: AV canal defects, including partial and complete (443, 67%), congenital mitral stenosis (CMS)/Shone's complex (76, 11%), HLHS with CMS (41, 6%), CMR (25, 3.7%), VSD/TOF/DORV (18, 2.7%), rheumatic disease/endocarditis (17, 2.5%), Marfan/Ehlers Danlos syndrome (10, 1.5%), and others (33, 5%). The most common fundamental diagnoses when considered by age at first operation are outlined in [Table 1]. The primary indication for operation was AV canal in 360 patients. Of the other 364 MV repair operations, the primary indication for operation was mitral regurgitation in 53% (194 of 364), mitral stenosis and regurgitation in 25% (92 of 364) and mitral stenosis in 12% (42 of 364) and another indication in 10% (37 of 364) of the operations. Of the 54 MV replacements, the primary indication for operation was mitral stenosis and regurgitation in 48% (26 of 54), mitral stenosis in 37% (20 of 54) and mitral regurgitation in 13% (7 of 54) and another indication in 2% (1 of 54) of the operations. Follow-up data were available in 628 of 673 patients, ranging from 1 day to 6.1 years. There was definitive late follow up after discharge in 377 of 673 patients up to 6.1 years. Considering all 778 mitral valve operations, the 30-day hospital discharge and overall mortalities were 1.3% (10 of 778 operations), 2.8% (22 of 778 operations), and 4.1% (32 of 778 operations), respectively. Mortalities occurred a median of 9.3 days (MM, 1-27 days), 36 days (MM, 1 day-20.3 months), and 64 days (MM, 1 day-34.2 months) from the most recent MV surgery, respectively. When considering all 673 patients undergoing MV operations; the 1-, 3-, 6-, 12-, 18-, 24-month and 5-year survivals were 98.5%, 97.3%, 96.9%, 96.1%, 95.5%, 95.4%, and 95.2% respectively. 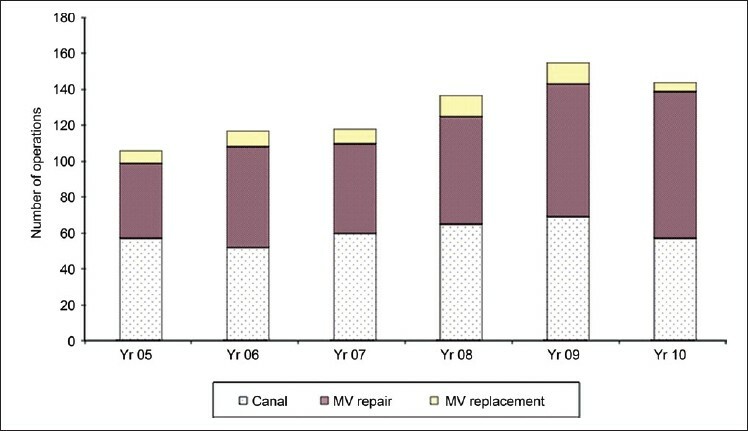 Excluding AV canals, [Figure 5] shows survival stratified by MV repair versus MVR. 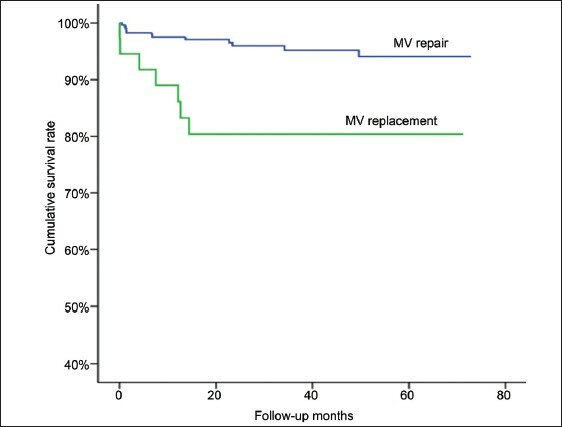 Five-year survival was greater for MV repair (96.0%) versus MVR (81.1%) (log-rank P<0.0001). When considering patients undergoing MV repair; the 1-, 3-, 6-, 12-, 18-, 24-month and 5-year survivals were 98.3%, 98.3%, 98.3%, 97.6%, 97.3%, 96.6%, and 96%, respectively. When considering all patients undergoing MVR, the 1-, 3-, 6-, 12-, 18-, 24-month and 5-year survivals were 94.6%, 94.6%, 91.9%, 91.9%, 81.1%, 81.1%, and 81.1%, respectively. With regard to reoperation, 14% of the 673 patients had a previous cardiac operation prior to 2005 of which in 54% was a MV procedure. Eighty-six percent of all patients underwent their first MV operation between 2005-2010 and of these patients, 11% underwent redo operations during the same period. From 2005 to 2010, definitive reoperation data were available for analysis in 11% of the 673 patients. They underwent 105 reoperations on the mitral valve. These operations occurred from 4 days up to 3.5 postoperative years with a median of 196 days from prior mitral valve operation for a total of 62.7 total patient years. Of these patients having their initial operation between 2005-2010 and undergoing reoperation, there were 48 patients that had one reoperation, 16 patients that had two reoperations, seven patients that had three reoperations, and one patient that had four reoperations. The most common fundamental diagnoses in the 72 patients undergoing MV re-operations were AV canal, HLHS-MS, and congenital mitral stenosis. When considering all 673 patients undergoing mitral valve operations, freedom from reoperation was 97.3%, 96.3%, 94.8%, 93.2%, 91.5%, 90.5% and 89.3% at 1-, 3-, 6-, 12-, 18-, 24-month and 5-years, respectively. This report highlights the recent surgical experience at Boston Children's Hospital and comments on several important and evolving technical considerations. There are many lesions that often co-exist with congenital mitral valve disease with certain subsets continuing to present a surgical challenge. In our most recent series, we found that mitral valve reconstruction or repair rather than replacement is associated with improved survival of patients that have underlying congenital mitral valve disease. Kanani et al. showed, in a morphological study of normal and CAVC hearts, that the neo-anterior mitral leaflet is very different from the normal mitral valve  with a rectangular rather than triangular shape, deficient chordal arrangement, and fewer secondary and tertiary chords. They also found that the axis of chordal attachment to the leaflet [Figure 2]b and [Figure 2]c could provide the biomechanical basis for tension on the repaired cleft and encourage reopening at the tip of the newly created leaflet, and proposed that cleft closure extending below the zone of apposition may reduce the tension on the repaired cleft. Our preferred technique for cleft closure is the double-layer running suture. The first layer is a running horizontal mattress and the second layer is a simple running over-and-over suture, which is not tightened but left loose enough to help the pliability of the unified leaflet and avoids shortening leaflet height. The leaflet edges at the cleft are frequently rolled and coapt over a small surface area. Care must be taken to preserve this degree of coaptation in closing the cleft and not to unroll the leaflet edges, because leaflet coaptation adds strength to the cleft closure, as it has been shown in mitral  and aortic  valve repair. The left atrioventricular valve annulus is very different from a normal mitral annulus, composed of a composite of native annulus and septal defect closure material or ventricular septal crest, depending on the CAVC repair, and no fibrous trigones. Over time, the degree of regurgitation increases by 1 grade in 41% of patients with repaired CAVC  and the annulus progressively dilates. Regurgitation could thus be seen as a two hit event, with biomechanical forces tending to pull apart the segment of neo-anterior leaflet below the cleft closure, and annular dilatation making this distal cleft functionally more important and the cause of regurgitation. Further studies into the segmental mechanism of annular dilatation after CAVC repair, such as can be provided by three-dimensional echocardiography,  would be helpful. Also, if prophylactic annuloplasty is shown to be beneficial, the ideal means of annuloplasty, for example, the entire posterior annulus or only at the commissures, as well as the material used, such as a small diameter nonabsorbable suture that could be expected to break with growth but provide structural stability for an extended period, absorbable suture versus biodegradable annuloplasty rings,  need to be defined. As mentioned above, the cleft is completely closed in all patients in whom stenosis is not a concern. However, partial closure in patients with parachute or forme fruste parachute mitral valve has not been formally evaluated. In patients with AV canal lesions, we have focused on the techniques of cleft closure and the utility of annuloplasty. We strongly feel that the biomechanical forces predispose the left atrioventricular valve to dysfunction that can be minimized by carrying the cleft closure down to the level of the chords. Apposition of the cleft alone sets it up so that there is maximal stress on the distal cleft closure, making it at risk for cleft dehiscence. Extending the cleft closure down to the tips of the chords may allow for distribution of this force lower down, possibly decreasing stress on the cleft closure. Following these observations, we have selectively applied a combination of complete cleft closure and under sizing suture annuloplasty at the time of primary CAVC repair. Although in this series annuloplasty consisted of a mix of De Vega-type double running posterior suture annuloplasty and commissural annuloplasty, we now routinely perform prophylactic posterior annuloplasty in many patients undergoing repair of CAVC where mitral stenosis is not a concern. Congenital mitral stenosis is a rare and morphologically heterogeneous disease. ,, As described by Ruckman and Van Praagh,  it can affect any one of the components of the mitral valve, from above the annulus (supramitral ring) or the annulus itself, the leaflets and/or the subvalvar apparatus. It is frequently associated with additional left heart obstruction or ventricular septal defect. Interventional management in severe mitral stenosis has been advocated,  as medical management entails significant morbidity and mortality. Interventional balloon dilatation has been shown to effectively relieve left ventricular inflow obstruction in most infants and children with severe congenital mitral stenosis who require intervention, although with a rate of freedom from failure of bi-ventricular repair or mitral valve reintervention of 76% at 1 month, 55% at 1 year and 39% at 5 years. Surgical mitral valve repair for CMS may relieve inflow obstruction, but the success of these procedures may vary according to the pathology. Valve repair rather than replacement for congenital mitral dysplasia or CMS has been advocated, mostly because of the high rate of re-operation and heart block requiring pacemaker implantation, particularly in small children, , after valve replacement. There is relatively little data on the results of surgical repair for congenital mitral stenosis, , and criteria for patient selection and anatomical subgroups amenable to repair as of yet are not completely known. Despite our attempts at delaying early intervention to allow for early AV valve remodeling and development in patients with congenital MS, over the last decade our tendency toward earlier mitral valve reconstruction versus replacement has increased. Mitral valve reconstruction with retention of the native subvalular apparatus has been said to offer distinct advantages by conserving the ventricular geometry resulting in the improved long-term ventricular function. We now routinely employ conservative techniques to avoid MVR in infants and children. Despite the fact that MVR has been successfully reported in young children, ,, there are still persistent unavoidable problems such as heart block, endocarditis, thrombosis and stroke. Several groups have also pointed out early predictors of mortality after MVR: the fundamental diagnosis, patient age, or size,  ventricular function and the size of prosthetic mitral valve. All of that make the subset of patients with congenital mitral stenosis and/or Shone's syndrome (small left-sided structures) particularly challenging. In addition to the technical improvements, there are many other important considerations that have led to an increase in MV reconstruction over the last decade. There have been dramatic advances in understanding the pathology  with preoperative imaging using two- and three-dimensional echocardiography to provide a precise delineation of the associated pathology. Additionally, specific techniques for patients with complex AV canal lesions and congenital mitral stenosis have improved. We have been much more aggressive in our approach to the subvalular apparatus by dividing/splitting papillary muscles and secondary tethering chords. As timing of such interventions has been important, we will often accept "less-as-more" at the initial operation realizing multiple operations with shorter intervals will be required but avoiding the need for MVR. Although MV repair may be associated with an increased number of reoperations, it is associated with improved 5-year survival compared to MVR in pediatric patients. At some point following multiple MV repairs, however, MVR will prove to be preferred but further follow-up and analysis is necessary to better define that time point. 1. Caldarone CA, Raghuveer G, Hills CB, Atkins DL, Burns TL, Behrendt DM, et al. Long-term survival after mitral valve replacement in children aged <5 years: A multi-institutional study. Circulation 2001;104(12 Suppl 1): I143-7. 2. Stellin G, Padalino MA, Vida VL, Boccuzzo G, Orru E, Biffanti R, et al. Surgical repair of congenital mitral valve malformations in infancy and childhood: A singlecenter 36-year experience. J Thorac Cardiovasc Surg 2010;140:1238-44. 3. Wood AE, Healy DG, Nolke L, Duff D, Oslizlok P, Walsh K. Mitral valve reconstruction in a pediatric population: Late clinical results and predictors of long-term outcome. J Thorac Cardiovasc Surg 2005;130:66-73. 4. Litwin SB, Tweddell JS, Mitchell ME, Mussatto KA. The double patch repair for complete atrioventricularis communis. Semin Thorac Cardiovasc Surg Pediatr Card Surg Annu 2007:21-7. 5. Crawford FA. Atrioventricular canal: Single-patch technique. Semin Thorac Cardiovasc Surg Pediatr Card Surg Annu 2007:11-20. 6. Nicholson IA, Nunn GR, Sholler GF, Hawker RE, Cooper SG, Lau KC, et al. Simplified single patch technique for the repair of atrioventricular septal defect. J Thorac Cardiovasc Surg 1999;118:642-6. 7. Wilcox BR, Jones DR, Frantz EG, Brink LW, Henry GW, Mill MR, et al. Anatomically sound, simplified approach to repair of "complete" atrioventricular septal defect. Ann Thorac Surg 1997;64:487-93; discussion 493-4. 8. Myers PO, Cikirikcioglu M, Aggoun Y, Murith N, Kalangos A. No-patch technique for complete atrioventricular canal repair. Ann Thorac Surg 2010;90:317-9. 9. Stellin G, Padalino M, Milanesi O, Vida V, Favaro A, Rubino M, et al. Repair of congenital mitral valve dysplasia in infants and children: Is it always possible? Eur J Cardiothorac Surg 2000;18:74-82. 10. Ruckman RN, van Praagh R. Anatomic types of congenital mitral stenosis: Report of 49 autopsy cases with consideration of diagnosis and surgical implications. Am J Cardiol 1978;42:592-601. 11. Carpentier A, Brizzard C. Congenital malformations of the mitral valve. In: Stark J, de Leval M, editors. Surgery for congenital heart defects. Philadelphia, PA: W.B.Saunders; 1994. p. 599-614. 12. Castaneda AR, Anderson RC, Edwards JE. Congenital mitral stenosis resulting from anomalous arcade and obstructing papillary muscles. Report of correction by use of ball valve prosthesis. Am J Cardiol 1969;24:237-40. 13. Gogoladze G, Dellis SL, Donnino R, Ribakove G, Greenhouse DG, Galloway A, et al. Analysis of the mitral coaptation zone in normal and functional regurgitant valves. Ann Thorac Surg 2010;89:1158-61. 14. le Polain de Waroux JB, Pouleur AC, Robert A, Pasquet A, Gerber BL, Noirhomme P, et al. Mechanisms of recurrent aortic regurgitation after aortic valve repair: Predictive value of intraoperative transesophageal echocardiography. JACC Cardiovasc Imaging 2009;2:931-9. 15. Carpentier A. Cardiac valve surgery-the "French correction". J Thorac Cardiovasc Surg 1983;86:323-37. 16. Carpentier A, Branchini B, Cour JC, Asfaou E, Villani M, Deloche A, et al. Congenital malformations of the mitral valve in children. Pathology and surgical treatment. J Thorac Cardiovasc Surg 1976;72:854-66. 17. Fisher T. Two cases of congenital disease of the left side of the heart. Br Med J 1902;1:639-41. 18. Shone JD, Sellers RD, Anderson RC, Adams P Jr, Lillehei CW, Edwards JE. The developmental complex of "parachute mitral valve," supravalvular ring of left atrium, subaortic stenosis, and coarctation of aorta. Am J Cardiol 1963;11:714-25. 19. McElhinney DB, Sherwood MC, Keane JF, del Nido PJ, Almond CS, Lock JE. Current management of severe congenital mitral stenosis: Outcomes of transcatheter and surgical therapy in 108 infants and children. Circulation 2005;112:707-14. 20. Kalangos A, Christenson JT, Beghetti M, Cikirikcioglu M, Kamentsidis D, Aggoun Y. Mitral valve repair for rheumatic valve disease in children: Midterm results and impact of the use of a biodegradable mitral ring. Ann Thorac Surg 2008;86:161-8; discussion 168-9. 21. Myers P, Beghetti M, Cikirikcioglu M, Sierra J, Aggoun Y, Touati R, et al. Novel approach to mitral valve repair in childhood dilated cardiomyopathy. Minerva Chir 2011;66:119-21. 22. Pektok E, Sierra J, Cikirikcioglu M, Müller H, Myers PO, Kalangos A. Midterm results of valve repair with a biodegradable annuloplasty ring for acute endocarditis. Ann Thorac Surg 2010;89:1180-5. 23. Myers PO, Beghetti M, Kalangos A. Biodegradable mitral annuloplasty for congenital ischemic mitral regurgitation. Thorac Cardiovasc Surg 2009;57:363-4. 24. Kalangos A, Sierra J, Vala D, Cikirikcioglu M, Walpoth B, Orrit X, et al. Annuloplasty for valve repair with a new biodegradable ring: An experimental study. J Heart Valve Dis 2006;15:783-90. 25. Mrowczynski W, Mrozinski B, Kalangos A, Walpoth BH, Pawelec-Wojtalik M, Wojtalik M. A biodegradable ring enables growth of the native tricuspid annulus. J Heart Valve Dis 2011;20:205-15. 26. van Praagh S, Porras D, Oppido G, Geva T, Van Praagh R. Cleft mitral valve without ostium primum defect: anatomic data and surgical considerations based on 41 cases. Ann Thorac Surg 2003;75:1752-62. 27. Wetter J, Sinzobahamvya N, Blaschczok C, Brecher AM, Grävinghoff LM, Schmaltz AA, et al. Closure of the zone of apposition at correction of complete atrioventricular septal defect improves outcome. Eur J Cardiothorac Surg 2000;17:146-53. 28. Kanani M, Elliott M, Cook A, Juraszek A, Devine W, Anderson RH. Late incompetence of the left atrioventricular valve after repair of atrioventricular septal defects: The morphologic perspective. J Thorac Cardiovasc Surg 2006;132:640-6, 646.e1-3. 29. Yamauchi T, Taniguchi K, Kuki S, Masai T, Noro M, Nishino M, et al. Evaluation of the mitral valve leaflet morphology after mitral valve reconstruction with a concept "coaptation length index". J Card Surg 2005;20:432-5. 30. Kanani M, Tsang V, Cook A, Kostolny M. Re-repair of the left atrioventricular valve in atrioventricular septal defects: The morphologic approach to the role of Goretex band reduction annuloplasty. Eur J Cardiothorac Surg 2010;37:273-8. 31. Rhodes J, Warner KG, Fulton DR, Romero BA, Schmid CH, Marx GR. Fate of mitral regurgitation following repair of atrioventricular septal defect. Am J Cardiol 1997;80:1194-7. 32. Miyamura H, Eguchi S, Watanabe H, Kanazawa H, Sugawara M, Tatebe S, et al. Total circular annuloplasty with absorbable suture for the repair of left atrioventricular valve regurgitation in atrioventricular septal defect. J Thorac Cardiovasc Surg 1994;107:1428-31. 33. Padala M, Vasilyev NV, Owen JW, Jr, Jimenez JH, Dasi LP, del Nido PJ, et al. Cleft closure and undersizing annuloplasty improve mitral repair in atrioventricular canal defects. J Thorac Cardiovasc Surg 2008;136:1243-9. 34. Barrea C, Levasseur S, Roman K, Nii M, Coles JG, Williams WG, et al. Three-dimensional echocardiography improves the understanding of left atrioventricular valve morphology and function in atrioventricular septal defects undergoing patch augmentation. J Thorac Cardiovasc Surg 2005;129:746-53. 35. Collins-Nakai RL, Rosenthal A, Castaneda AR, Bernhard WF, Nadas AS. Congenital mitral stenosis. A review of 20 years' experience. Circulation 1977;56:1039-47. 36. Beierlein W, Becker V, Yates R, Tsang V, Elliott M, de Leval M, et al. Long-term follow-up after mitral valve replacement in childhood: Poor event-free survival in the young child. Eur J Cardiothorac Surg 2007;31:860-5. 37. Selamet Tierney ES, Pigula FA, Berul CI, Lock JE, del Nido PJ, McElhinney DB. Mitral valve replacement in infants and children 5 years of age or younger: Evolution in practice and outcome over three decades with a focus on supra-annular prosthesis implantation. J Thorac Cardiovasc Surg 2008;136:954-61, 961.e1-3. 38. Serraf A, Zoghbi J, Belli E, Lacour-Gayet F, Aznag H, Houyel L, et al. Congenital mitral stenosis with or without associated defects: An evolving surgical strategy. Circulation 2000;102(19 Suppl 3): III166-71. 39. David TE, Armstrong S, Sun Z. Left ventricular function after mitral valve surgery. J Heart Valve Dis 1995;4 Suppl 2:S175-80. 40. Kadoba K, Jonas RA, Mayer JE, Castaneda AR. Mitral valve replacement in the first year of life. J Thorac Cardiovasc Surg 1990;100:762-8. 41. Rafii DY, Davies RR, Carroll SJ, Quaegebeur JM, Chen JM. Age less than two years is not a risk factor for mortality after mitral valve replacement in children. Ann Thorac Surg 2011;91:1228-34. 42. Raghuveer G, Caldarone CA, Hills CB, Atkins DL, Belmont JM, Moller JH. Predictors of prosthesis survival, growth, and functional status following mechanical mitral valve replacement in children aged <5 years, a multi-institutional study. Circulation 2003;108 Suppl 1:II174-9. 43. Eble BK, Fiser WP, Simpson P, Dugan J, Drummond-Webb JJ, Yetman AT. Mitral valve replacement in children: Predictors of long-term outcome. Ann Thorac Surg 2003;76:853-9; discussion 859-60. 44. Acar P, Laskari C, Rhodes J, Pandian N, Warner K, Marx G. Three-dimensional echocardiographic analysis of valve anatomy as a determinant of mitral regurgitation after surgery for atrioventricular septal defects. Am J Cardiol 1999;83:745-9. 45. 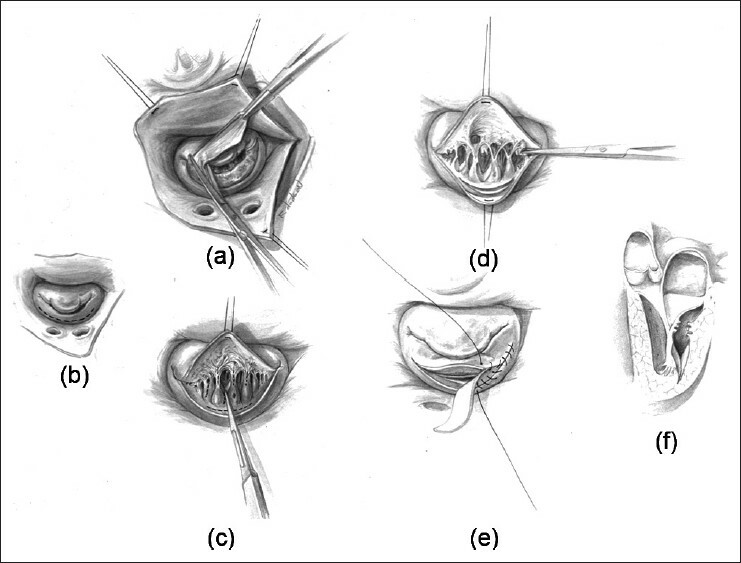 Anderson RH, Kanani M. Mitral valve repair: Critical analysis of the anatomy discussed. MMCTS 2007;(0219):2147.